When I saw this recipe I thought I was going to fall in love. Then I made a couple changes and KNEW I was in love! 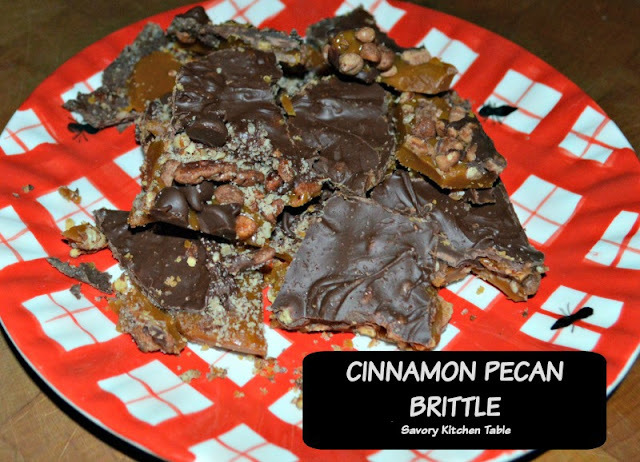 IT IS LIKE EATING A HEATH BAR WITH THE BONUS OF A HINT OF CINNAMON! Line a 15- x 10-inch jelly-roll pan with parchment paper, and lightly coat with cooking spray. Stir in granulated sugar, brown sugar, espresso, molasses, salt and 1/3 cup water. Cook, stirring constantly, until a candy thermometer registers 290° (soft crack stage), about 17 to 20 minutes. Remove pan from heat, and stir in pecans. Immediately pour mixture into prepared pan spreading in an even layer, and sprinkle bittersweet and semisweet chocolate morsels over top. Let stand 5 minutes and then spread and swirl the chocolate pieces using an offset spatula. Chill 1 hour or until firm. Store in an airtight container in refrigerator up to 7 days. LOL it is both. I probably won't make it again until the holidays for that very reason. Oh my gosh it IS. I am going to have to do a hundred miles on the treadmill! I can't wait to try it with some other nuts and flavors - like chopped cashews and half peanut butter chips.